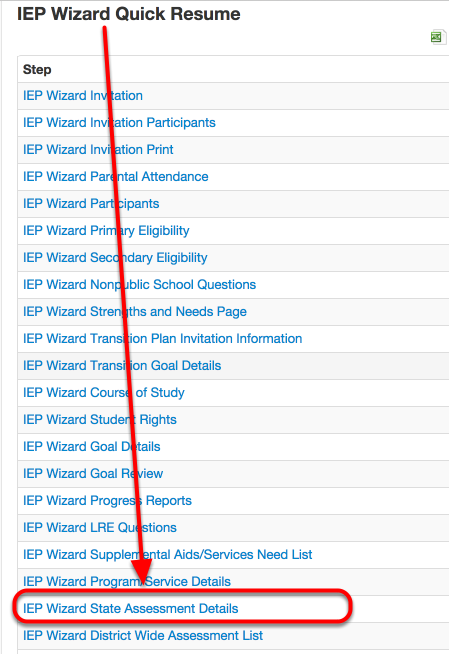 From the IEP Wizard Quick Resume Menu, select IEP Wizard State Assessment Details. 1. 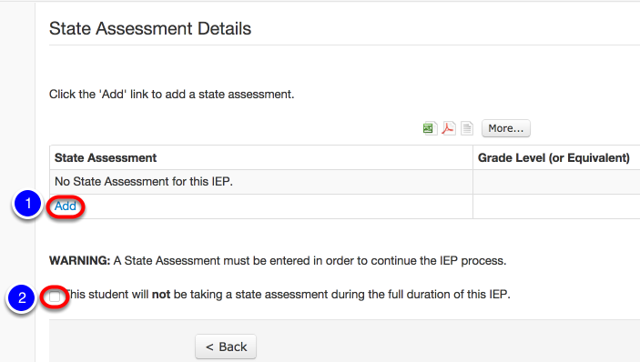 If the student will be taking a State Assessment during the full duration of this IEP click Add. 2. 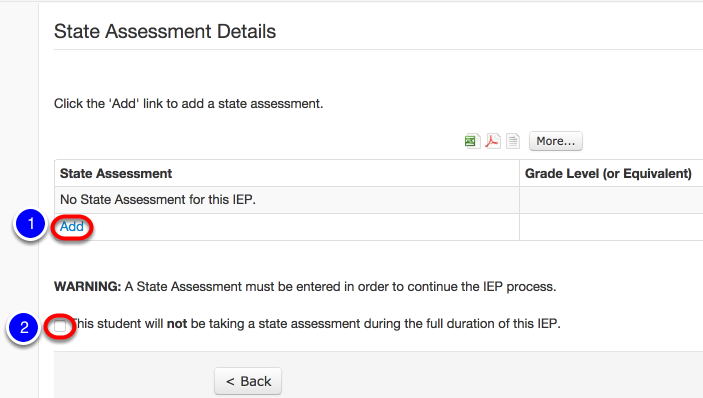 If the student will not be taking a State Assessment during the full duration of this IEP click radial button. This will take you to District-wide Assessment(s). 1. Use the drop down and select the Grade Level. 1. Select either General Assessments or MI-Access Alternate Assessment for each Assessment Subtest. 2. For each Mi-Access Alternate Assessment provide a rationale for the alternative assessment. 3. Click Save if no accommodations are needed for any of the Assessment Subtest(s). The system will take you to State Assessment Details/Add or Edit Accommodation(s). 4. Click Save & Add Accommodation(s) if accommodations are needed for any of the Assessment Subtest(s). 1. Highlight the Subtest(s) that require Accommodation(s). 3. Select Yes if the Accommodation is standard and No if the Accommodation is not standard. 4. Click Save if no further Accommodations need to be added. 5. Click Save & Add Another if further Accommodations need to be added. Continue adding until all Accommodations have been added. 1. Review State Assessment(s) and Accommodation(s) selected for each. 2. Click Edit to edit the State Assessment Accommodations. 3. Click Delete to remove the State Assessment and it's Accommodation(s). 4. Click Next to move to District-wide Assessment(s) Details. 1. Click Add to add a District-wide Assessment. 2. Click Next if there are no District-wide Assessments to add. 1. Type the name of the District-wide Assessment. 2. Type the name of the Alternative Assessment if the District-wide Assessment is not appropriate. 4. Select Yes or No as to whether the assessment is appropriate for the student. 5. Select Yes or No as to whether accommodations are needed for this assessment. 1. To add additional District-wide Assessments, click Add. 2. To add additional Accommodations to the current District-wide Assessment(s) select Add Accommodation. 3. Edit, View or Delete current District-wide Assessment(s) or Accommodations as appropriate. 3. If all District-wide Assessments have been added click Next.